Alaiyna B. Bath and Body: Brand new website! 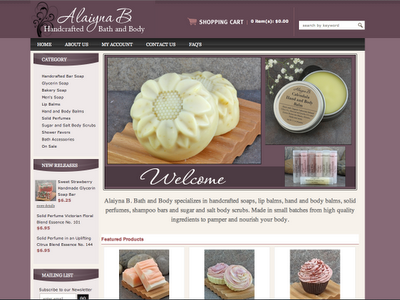 I just finished my brand new website for Alaiyna B. Bath and Body. It has been up and functioning for just a day or two and is fully stock with many more products coming soon. I decided to go with 3dcart as my web host for all the features that they offer. I love being able to offer both Paypal and onsite Credit Card payment processing. There customer service has been wonderful in helping to get my site up and running. I will be introducing new package for my body scrubs and offering them as a made to order product with your choice of exfoliant (fine grain sugar, sea salt or dead sea salt) and scent. These emulsified scrubs are great for all over exfoliation. Mini cupcake soaps are done curing and will be listed this week. These are uplifting citrus scents frosted in pink, green, mauve and orange - so cute and they make great gifts. Body lotions and creams will be debuting this fall in addition to shampoo bars and goat's milk soaps.